A ready-to-use graham cracker crumb crust and chopped chocolate-covered English toffee bars help keep the prep time for this cheesecake to just 10 minutes. Beat cream cheese, sugar and vanilla in large bowl with mixer until blended. Add eggs; mix just until blended. Stir in 3/4 cup chopped toffee bars. 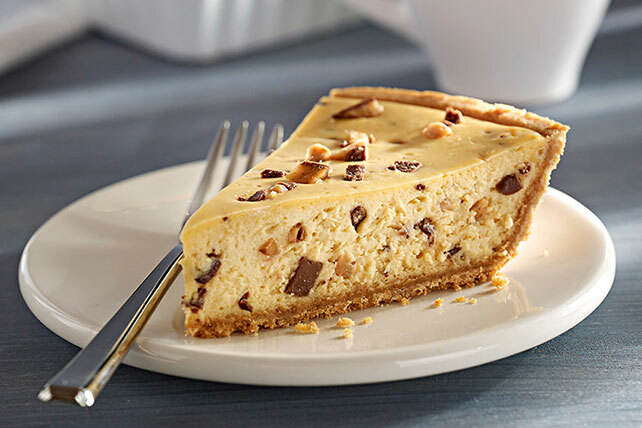 Pour into crust; sprinkle with remaining chopped toffee bars. Bake 35 to 40 min. or until center is almost set. Cool completely. Refrigerate 3 hours. Special recipes are fun to eat as part of an annual celebration. Enjoy a serving of this rich and indulgent dessert at your next family gathering. For extra chocolate flavor, substitute 1 OREO Pie Crust (6 oz.) for the graham pie crust.